Hang Nga is a guesthouse so, unlike many of the oddities that made the list, you can actually stay in it. The house, destined by Vietnamese architect, Dang Viet Nga, is located in Ward 4 in the city of Da Lat. The daughter of a former Vietnamese President owns the property. 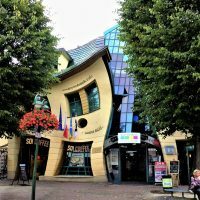 This rather melted looking structure is part of a shopping centre in Sopot. it was built in 2004 and its official title is Krzywy Domek. The design was inspired by the drawings of Jan Marin Szancer, a Polish stenographer and illustrator. As well as being a thoroughly weird building, it’s also home to Poland’s version of the Hollywood Walk of Fame. Although, it’s called the Wall of Fame here because…it’s a wall. This is not the type of building usually associated with the home or Grunge and Starbucks, but there you go. This shiny pink and metallic grey museum is, well…it’s nothing short of eye-catching, that’s for sure. The rock museum was designed by Frank Gehry, who designed one of my favourite buildings (the Guggenheim in Bilbao), but I can only assume he was drunk for this. Still, it’s a definite talking point and at least no one will ever be able to say they couldn’t find it. This Tokyo based monstrosity looks like the result of that time I bought Optimus Prime for my nephew and thought I’d have a go at changing him from a car. It did NOT go well, people. I thought I was smart, taking it out the box and having a shot before I wrapped it for Christmas. I mean, if an 8-year-old could do it, then I could manage it, yes? Anyway, that’s a story for another time. The point I’m trying to make is that the college looks like it was designed by a crazy Scottish woman. The college campus is described as being a mix of elements, representing a new order, but tolerant of chaos. Well, I agree with the last bit. For reasons quite unknown to us lay, people, it seems that government buildings have to be monstrosities. I don’t understand why this is, but I can only assume that the desire for fugly lumps of concrete is part of the spec they send out for firms to tender for. The Headquarters of the British Secret Service looks very much like something I could build from Lego. And I’m terrible at Lego. It was and was influenced by 1930s modern architecture and designed by Terry Farrell (cheers, Tel). Personally, I think when it was blown up in that James Bond movie I can’t quite recall the name of was the best thing that could have happened to it. This weird octagonal type library is the largest in Belarus and holds the third largest collection of Russian books in the world. What a claim to fame. The library stands proudly on the banks of the river in the capital of Minsk. It was completed in 2006. The building looks way better when lit up in an array of colour at night. By daylight, it kinda takes your breath away. And not in a good way. The National Library is widely used by city residents and it has a viewing deck from which visitors can look out over Minsk. That’s got to be a positive, no? Unfortunately, Saddam Hussein donated half a million dollars towards the build, so that officially negates any positives that come from the whole observation deck thing. It seems such a shame that so many cities across the world have managed to build amazing TV and radio towers and yet Prague’s is a hot mess. This eyesore took 7 years to build (how???) and has been horrifying locals and visitors for 25 years. Who in their right mind gave permission for this? And, more importantly, why aren’t they in Bad Decision Jail? Paris had its share of amazing architecture and often manages to combine modern architecture with classic buildings. On this occasion, it fails miserably. This shopping and cultural Centre is nothing like the wonderful symbol that is the Louvre’s glass pyramid. No. The Pompidou Centre looks very much like the builders gave up halfway through and still haven’t returned to dismantle the scaffolding. It’s an eyesore, which is a shame as Paris is world-famous for its beautiful buildings. This is one of Bangkok’s most recognisable buildings. Mainly because there aren’t many other buildings shaped like elephants in the Thai capital. Who’d have guessed? This 102-metre mix of offices, residences and stores had been standing proudly since 1997. The Chang was designed by Ong-ard Satrabhandhu and Dr Arun Chaisaree. The building is obviously supposed to look like an elephant. However, you’d be forgiven for thinking a small child created drew it for their Granny’s fridge and it wasn’t supposed to be taken any further. Still, things could be worse… It could be a giraffe. It’s hard to justify just how this concrete monster was allowed to be built anywhere near the incredible the Duomo of Milan, but here we are. Milán isn’t exactly Florence, but there’s still no excuse. This rather odd-looking building was completed in 1958, so at least we can use that as an excuse for its total fugliness. It’s hard to believe that it was designed by actual professional architects. And Italian ones at that. Shame on you all. Have you encountered any of the world’s ugliest buildings on your travels? Some real horrors among these!